The nutritional power of everyday foods always amazes me. Perhaps because they are so readily available we overlook their healing capacity. A common dipping tool for hummus and guacamole, a popular addition to salads and stews, the healing potential of carrots tends to be dismissed. In addition to containing many alkaline elements that assist your body in maintaining the acid-alkaline balance that is essential for optimal health, carrots have more than 490 phytochemicals. Each phytochemical provides different health benefits; some assist in detoxifying your body, others stimulate the immune system, modulate metabolism, and/or have antibacterial and antiviral qualities. We all know about how the high amounts of the carotenoid beta-carotene found in carrots (that converts into vitamin A in our bodies) supports healthy vision, skin, and bones, but did you know that carrots are a great source of disease fighting flavonoids? These flavonoids provide antioxidants that work towards neutralizing free radicals that attack the cells of your body, protecting them from forming cancer cells, causing premature aging, and taxing your immune system. Did you know that carrot juice is an effective diuretic? The combination of vitamins, minerals and antioxidants found in carrots promote detoxification and the elimination of excess water from your body. But that’s not all. 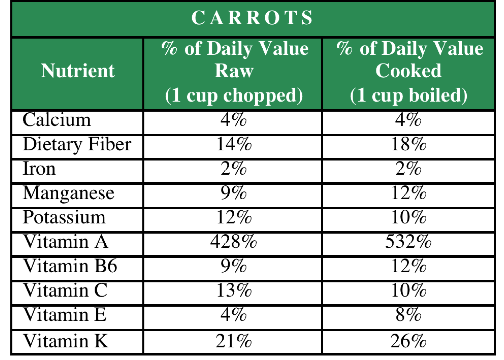 Below is a list of nutrients found in carrots. Raw or cooked, this vegetable holds a powerhouse of healing potential: Below are some of the ways these nutrients play a vital role in your health, reducing your risk of chronic disease and cancer. The British Journal of Nutrition (Nov 2011) reported that consuming deep orange fruit and vegetables, especially carrots, may provide you with a 32% lower risk of coronary heart disease. In addition, the antioxidants found in carrots work together synergistically to provide cardiovascular protective benefits. It is believed that obtaining any of these antioxidants in isolation from each other would not create the same effect. It is the nutrition from the whole food that provides the full health benefits. The calcium found in carrots helps prevent the narrowing of blood vessels, the potassium promotes regular heartbeat, and the vitamin C protects cells against free radicals and strengthens blood vessel walls. Learn more here and here. 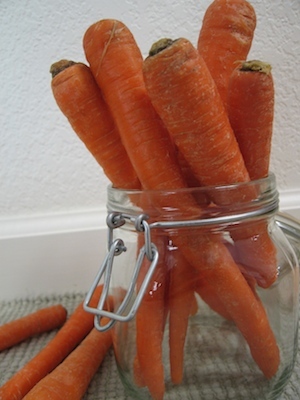 Antioxidants in carrots, including vitamin C and beta-carotene, are known to play a significant role in cancer prevention; In 1986, a case-control study on the effect carrots and green vegetables have on lung cancer found that smokers who ate carrots more than once a week had a lower risk of lung cancer. In 2011, a study investigated the effect of carrot juice extracts on leukemia and found evidence that carrot juice extract kills leukemia cells and inhibits their progression, making carrots an excellent source of bioactive chemicals to treat leukemia. According to the Harvard University School of Public Health (November 2013), eating foods rich in beta-carotene, like carrots, can boost male fertility, improving sperm motility by 6.5 – 8%. Carrots are available in the grocery stores year-round. If you purchase your carrots at a farmers market with the greens attached, remove them before storing to prevent the greens from drawing out moisture and nutrients from the roots. There are so many uses for carrots: shred them in salad and coleslaw, add them to wraps, steam or roast them for dinner, include them in muffins or cake to add a touch of sweetness, or juice them into a nutrient rich veggie drink. This entry was posted in Nutrition, Plant-based, Recipes, Vegan, WFPB, Whole food and tagged carrots, healing with carrots, health, Nutrition, power of carrots. Bookmark the permalink.